One of our eagle-eyed knitters has spotted a mistake in our all-in-one jumper pattern. You may remember that we uploaded a new pattern a while ago on this blog. We changed the old ‘fish ‘n chip’ jumper so that it has sleeves. Instead of having an all-ribbed bodice, the sleeves are now in stocking stitch as this doesn’t bunch up so much on little arms. That’s where the mistake was, so here it is corrected. Meanwhile we have had a HUGE delivery from the Mother Teresa group in Luton. 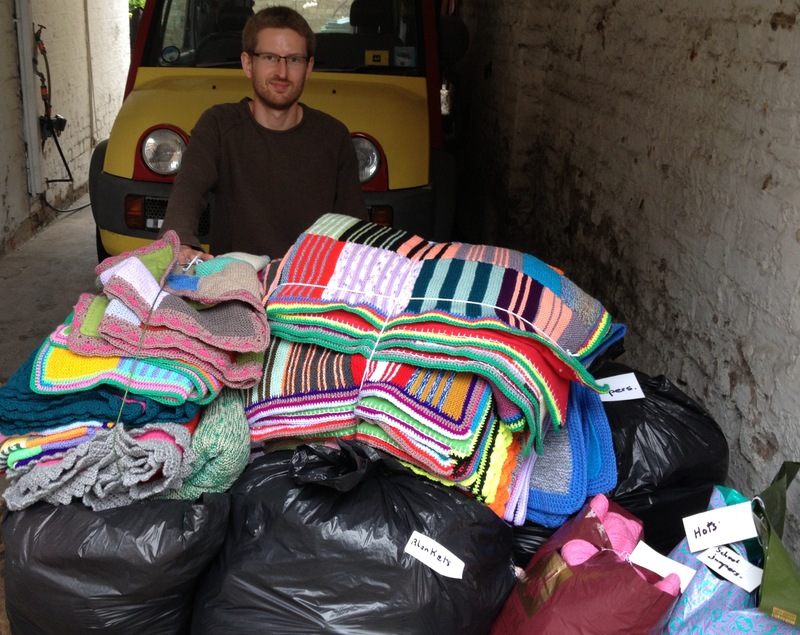 Here is Jamie sheltering from the rain with all the lovely knitting: two piles of blankets and loads of children’s jumpers too. 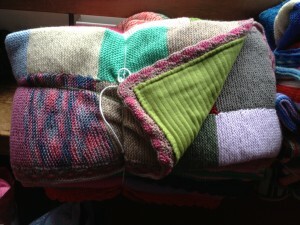 This group are very thoughtful and have lined their blankets with fleece. What a great idea. You can see a close-up of the way they have done it here on the wrong side. This will make the blankets so much warmer.